Kansas wide receiver Quan Hampton (6) has a pass broken up by TCU safety Ridwan Issahaku (31) during the second quarter, Saturday, Oct. 21, 2017 at Amon G. Carter Stadium in Fort Worth. 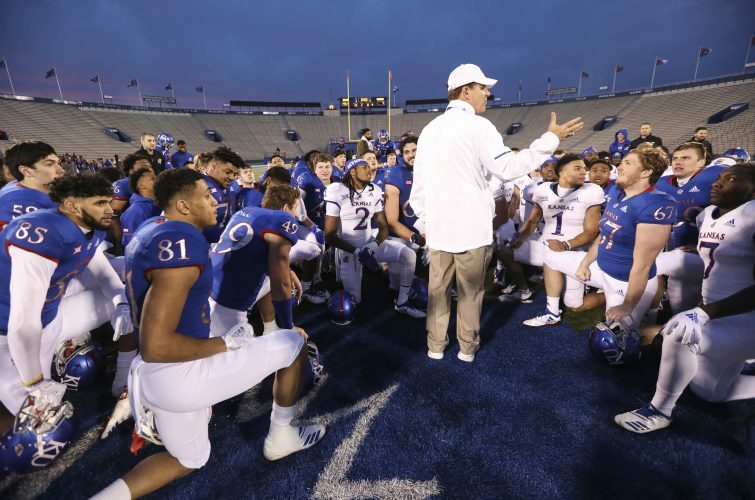 Fort Worth, Texas — Negativity ruled the night for the Kansas football team’s backpedaling offense Saturday at Amon G. Carter Stadium. No. 4 TCU swarmed and smothered the Jayhawks with 11 tackles for loss and four sacks. 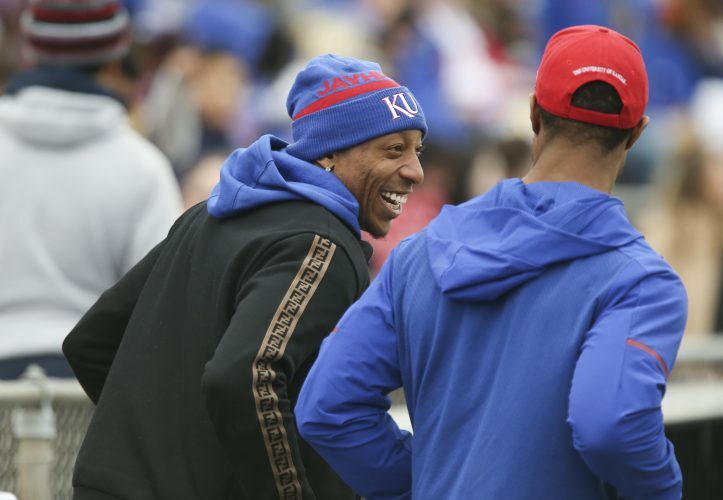 The KU offense went backward so often it finished with a Big 12-record low of 21 total yards in a 43-0 pounding. 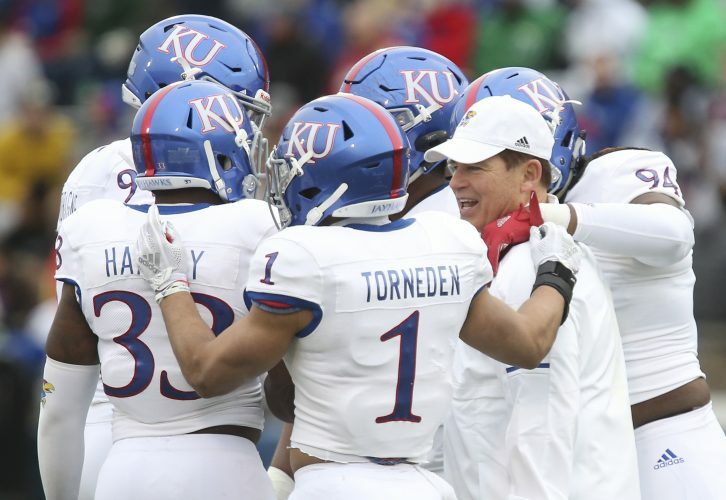 Things looked so bleak that KU (1-6 overall, 0-4 Big 12) entered the fourth quarter with minus-six yards of offense versus the heavily-favored Horned Frogs (7-0, 4-0). As woeful a turnover-free first half as fathomable assured the Jayhawks of the program’s 44th straight road defeat. By the time KU closed the final 1:09 of the second quarter with three Khalil Herbert carries in a row to eat up the clock and avoid further disaster, the branded Air Raid offense had netted all of three yards, setting the stage for the 21 total yards, the fewest by an FBS offense in the past 20 seasons. Those three harmless play calls to close out two quarters of non-productivity seemed months removed from the first series of the game, when KU picked up its lone first down of the first 40 minutes, with Peyton Bender finding tight end Ben Johnson for 13 yards. At that point, the Jayhawks had gained 16 yards on three plays. 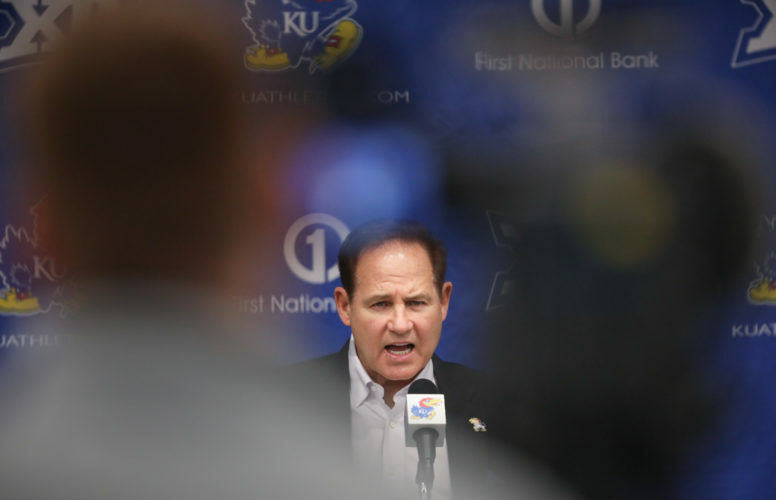 On the next 21 snaps of the first half, though, KU typically went the wrong direction, losing a total of 13 yards before returning to the locker room at intermission with minus-30 rushing yards and 33 passing yards. During the course of the disastrous first two quarters, which featured five three-and-outs, Bender completed five of his 10 pass attempts, often leaving misfires short, and took two sacks. Between Bender’s first-half rushing total of -14 yards (thanks to the sacks), a botched Taylor Martin carry that lost 12 more yards, and play upon play of blah that went nowhere, KU averaged 0.1 yards per play in a half during which TCU totaled 305, cruising to a 24-0 lead. Meeting at halftime to regroup and adjust didn’t even help the Jayhawks, who opened the third quarter with their most demoralizing series of the funk-filled thumping. 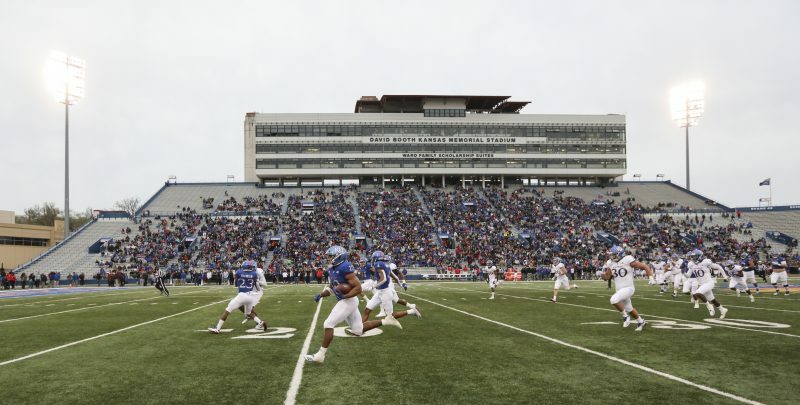 A Ryan Schadler rush lost six yards, Chris Bradley and Ross Blacklock sacked Bender for a four-yard loss on second down and Ben Banugo and Blacklock sacked Bender again on third, giving KU negative-15 yards on the series and minus-12 in the game. The pain continued for the overmatched visitors throughout the third quarter. 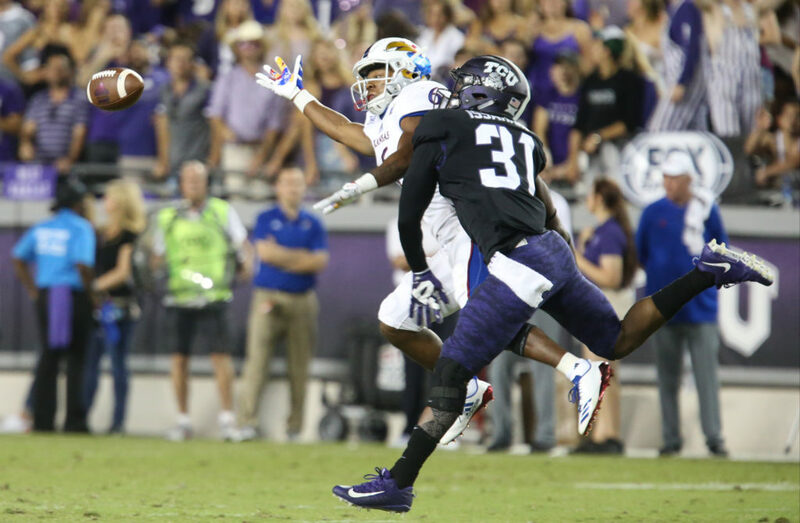 Although TCU gifted the Jayhawks a pair of first downs in the quarter via two separate pass interference penalties, another drive went three-and-out and the hapless quarter concluded with Steven Sims Jr. losing six yards on a rush. KU entered the fourth quarter with minus-six yards of offense. In the meantime, KU’s defense didn’t have much to feel positive about, either. In the second quarter, one play after Bryce Torneden sacked Kenny Hill for a loss of eight yards, the TCU quarterback bounced back by hitting John Diarse in stride down the sideline for a 67-yard score, one of Hill’s five touchdown throws before watching the final quarter from the bench. Hill completed 19 of his 26 pass attempts for 278 yards, with TD throws to Diarse (four catches, 130 yards, TD), Jalen Reagor (three receptions, 43 yards, 2 TDs), Taj Williams and Desmon White. Horned Frogs rushers ate up the Kansas defense, too, going for 191 yards on the ground and averaging 4.5 yards per carry, led by Darius Anderson (12 runs, 62 yards) and Kyle Hicks (10 carries, 57 yards). “I feel like we didn’t rise to the challenge at all. We played poorly on defense and poorly on offense and gave up a punt return (touchdown, 90 yards by KaVontae Turpin). So all three phases not good enough,” Dineen said. TCU put up 475 yards of offense to KU’s 21 in the beating, which featured just four Kansas first downs. It was up to backup QB Carter Stanley to save the Jayhawks from complete disaster. The redshirt sophomore entered the game with 10:35 left in the fourth quarter and the net yardage sitting at minus-four. Though Stanley completed one of just two throws for eight yards and rushed twice for nine yards, he did just enough on two series to get Kansas into positive-yardage territory on the night, with the aid of some Deron Thompson carries (five attempts for 10 yards). On a night starting QB Bender finished 7-for-16 passing for 38 yards and Johnson finished with a team-best 35 receiving yards, Adeniji said the entire offense felt frustrated in the locker room afterward.